For Christianity from its beginning, the cross has always mattered. The crucial question is: what does it mean? Why does it matter? What is its significance? In earliest Christianity, the cross of Jesus (always also including his resurrection) was utterly central. Central as revelation of God’s passion and Jesus’s passion for the transformation of this world; and as revelation of the way, the path, of personal transformation. I invite your comments as we continue the conversation. As we seek to “keep learning” here is a report to note. Please notice that the scholars quoted do not always agree about how to interpret what they are seeing. With that in mind, let’s, as a group, see what else we can discover about this dig in (ancient and buried Magdala) current day Migdal. In a city where Jesus’ companion Mary Magdalene lived and perhaps even met with Jesus, the discovery and excavation of a first-century synagogue is shedding new light on Judeo-Christian worship 2,000 years ago. 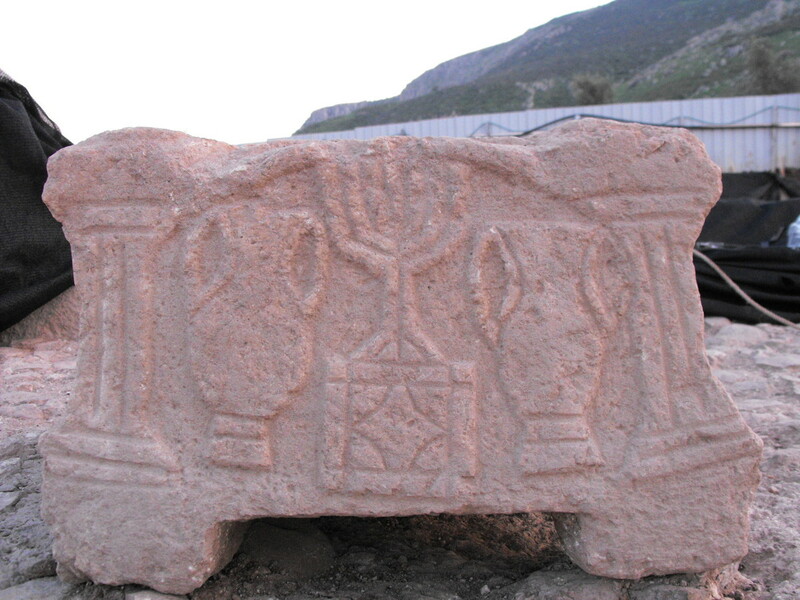 In 2009 a team of researchers in the town of Migdal on the shore of the Sea of Galilee in northern Israel discovered an ancient synagogue, one of only a handful dating back to the time of Jesus, when the town was a small fishing village known as Magdala. An ongoing excavation at the Magdala synagogue has since turned up valuable artifacts including a rosette mosaic and a special table that may once have displayed Torah scrolls with a stone relief of a seven-branched candelabrum, according to Haaretz. What archaeologists know about the synagogue’s construction also suggests to some scholars that Jews and the earliest Judeo-Christians may have worshipped together at the holy site, per Haaretz. Read the entire post (on Huffington Post Religion), and see more photos, too. this is the song of the chimes today. The prayer, “Attributed to St. Francis,” may be found in the (Episcopal) Book of Common Prayer on page 833. Too often the price exacted by society for security and respectability is that the Christian movement in its formal expression must be on the side of the strong against the weak. This is a matter of tremendous significance, for it reveals to what extent a religion that was born of a people acquainted with persecution and suffering has become the cornerstone of a civilization and of nations whose very position in modern life too often has been secured by a ruthless use of power applied to defenseless peoples. For us Christians, healing and liberation are inexorably tied together. For Jesus, healing is always an act of liberation. For his followers, liberation for some involves healing for all. …let us not delude ourselves. The Episcopal Church, as a denomination, participated in both overt and tacit segregation. Today 86.7% of American Episcopalians are white. The Washington National Cathedral staff, congregation, and chapter are overwhelmingly white. We are at once the cathedral church for the Episcopal Diocese of Washington and the most visible faith community in the nation’s capital. Yet we have a largely non-existent record of involvement or investment in the other three quadrants of the District of Columbia. How can we, with integrity, presume to “speak truth to power” about racial justice when we are, in fact, implicated in the very structures of injustice? How can we call others into righteousness when we are ourselves caught in a web of sin?. Friends, what we have here is a very big log in our eyes. Our problem is not the racism of any one individual, because racism is not only personal. It is also interpersonal, institutional, and social. This fiftieth anniversary of Martin Luther King’s speech and the march that occasioned it demands that we take an inventory of ourselves yes personally, but also interpersonally, institutionally, and socially. What does it mean to belong to an 86% white denomination when, by 2040, there will be no one majority race or ethnic group in America? What does it mean to call ourselves the “National” Cathedral when we confine our ministry to the whitest and most privileged quadrant of the District of Columbia? How can we live into the dream articulated by Dr. King when the evils we face in 2013 are so much more insidious than they were in 1963? The enemy back then looked and acted like Lester Maddox and Bull Connor. The enemy today looks and acts very much like you and me. I invite you to read his sermon. Listen carefully for the Spirit, the same Spirit involved in the call of Jeremiah, the healing moment in the life of the unnamed woman healed by Jesus long ago, and the words and ministry of Dr. Martin Luther King, Jr. The Spirit is not done speaking and not done working with folks like you and me. “Healing, freedom, liberation” are the sounds ringing from the chimes today. Brothers, I ask you to bear with this message of encouragement … . We have been reading in the Letter to the Hebrews the past few Sundays (in August 2013). The author calls his work a “message of encouragement” (other translations use “my word of exhortation”). Whether a message of encouragement or a word of exhortation the author clearly wants to support and affirm and challenge his hearers to keep their focus on Jesus (see Hebrews 12:1-2) and move forward into an uncertain and uncontrollable future as did our ancestors in the faith: with trust in God who over time has proven to be trustworthy. ‘Persecuted’ British Christians need to ‘grow up’, says former Archbishop Rowan Williams. Christians complaining of persecution in Britain need to “grow up”, the former Archbishop of Canterbury has said, as he argues feeling “mildly uncomfortable” is not comparable to real suffering elsewhere. Further illuminating his words are reports and stories of the burning of churches in Egypt, Christians living in caves and fear on the border between Sudan and South Sudan, the difficult lives of Palestinian Christians in the Gaza Strip, the very uncertain future of Christians in Syria, and the tenuous circumstances of Christians in China. These are life and death situations and the response of faith may indeed be difficult and the discouragement that anything can change for the better must be overwhelming at times. To these Christians the words of the author of Hebrews must come like a balm to heal and make strong and give hope. So, to be verbally abused in England or in the United States for being Christian; even to be ridiculed for trust in God (when evil and painful situations abound) or to receive the vehement incredulity and head-shaking dismissal from those who conclude that there is no God is minor by comparison (just ask Rowan Williams, or me). Yet, such is our situation and the author of Hebrews speaks to our situation, too (seen in its proper global perspective, of course). What are your struggles and how is the ancient word in the Letters to the Hebrews a word of encouragement? How might we “be with” our brothers and sisters in Christ whose persecution, whose situation, is far more pressing, and even life-threatening? Leave a comment and continue the conversation. “Stay with it, stay with it” is the song of the chimes today.